PARIS (CNS) — A major blaze engulfed the iconic Notre Dame Cathedral April 15, sending pillars of flame and billowing smoke over the center of the French capital. Officials ordered an evacuation of the area around the 850-year-old cathedral that has withstood world wars and political turmoil throughout France’s history. Le Monde, a Paris daily newspaper, reported that the fire erupted in the attic of the cathedral. Televised images showed the church’s iconic steeple was ablaze. The Associated Press reported that Paris Mayor Anne Hidalgo said about an hour after the fire started that firefighters were attempting to contain a “terrible fire” at the cathedral. An AP reporter at the scene said the roof at the back behind the cathedral, behind the nave, was in flames and yellow-brown smoke and ash filled the sky. The cathedral dedicated to the Blessed Mother was begun in 1163 and took almost two centuries to build. It was completed in 1345. Among its architectural and artistic treasures are the iconic flying buttresses in the rear of the cathedral, its tall central spire — which collapsed into the interior during the fire — and a rose window installed in the 12th century that is said to be the largest stained-glass window in the world, according to the cathedral’s website. Also present was a still-functioning 17th century pipe organ. “Everything is burning. 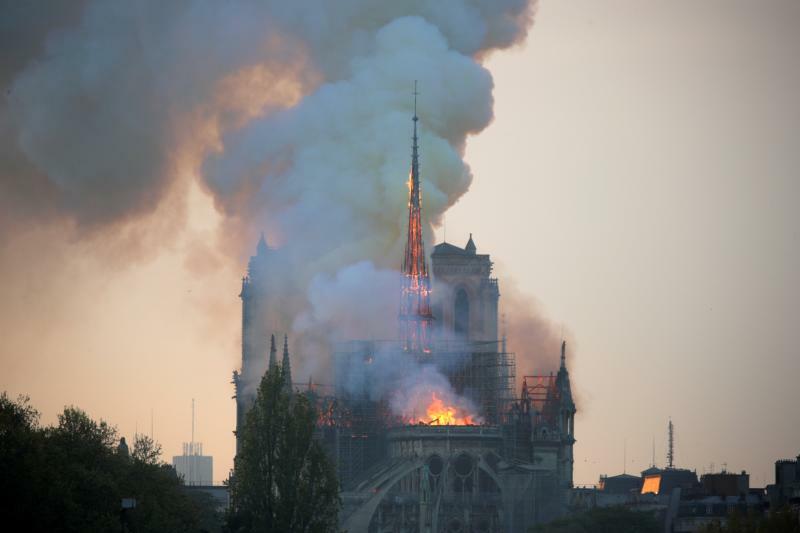 The framing, which dates from the 19th century on one side and the 13th on the other, there will be nothing left,” Andre Finot, a spokesman for the cathedral, told Agence France-Presse. “I had a scream of horror. I was ordained in this cathedral,” Bishop Eric Moulin-Beaufort of Reims, president of the French bishops’ conference, said in reaction to the disaster. “We express our closeness to the French Catholic and to the people of Paris. We pray for the firefighters and for all those who are doing everything possible to face this dramatic situation,” the statement said. “The horrific fire that is engulfing the Cathedral of Notre-Dame de Paris is shocking and saddens us all, for this particular cathedral is not only a majestic church, it is also a world treasure,” said Cardinal Daniel N. DiNardo of Galveston-Houston, president of the U.S. Conference of Catholic Bishops. “Noble in architecture and art, it has long been a symbol of the transcendent human spirit as well as our longing for God,” the cardinal said in a statement April 15. “Our hearts go out to the archbishop and the people of Paris, and we pray for all the people of France, entrusting all to the prayers and intercession of the Mother of God, especially the firefighters battling the fire. 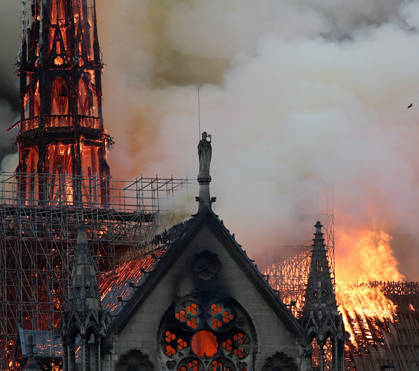 “We are a people of hope and of the resurrection, and as devastating as this fire is, I know that the faith and love embodied by this magnificent cathedral will grow stronger in the hearts of all Christians,” he added. “God preserve this splendid house of prayer, and protect those battling the blaze,” he said he prayed. Audrey Azoulay, director general of UNESCO, the United Nation’s cultural agency, said in a tweet that her office “stood at France’s side to save and restore” the cathedral, which was added the organization’s world heritage list in 1991. She described the cathedral as “a priceless heritage” and that the agency was monitoring the effort to fight the blaze.